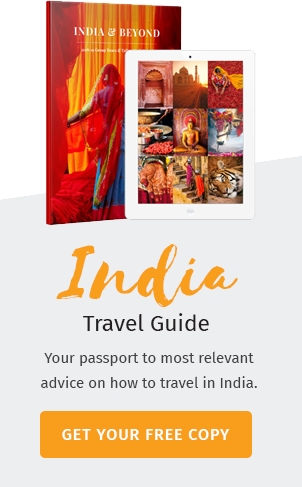 As you travel to the land of Karnataka, especially if you are visiting it again, there will rise a growing excitement through your body that creates ripples of joy upon embarking to the state. With its pristine hills stations that drizzles nature’s bounty on you to the bustling cities that take modernization to the next level, Karnataka is a haven trove for tourists. Set in the comfortable lap of nature is the dazzling yet humble hill station is the serene hill station of Sakleshpur. Set amidst a backdrop that resembles a Bronte novel, Sakleshpur is devoid of tourists populating the region. Lying in the Western Ghats, this beautiful hill station has a mesmerizing effect on visitors. Sakleshpur has a mix of plantations that includes coffee, areca, cardamom and pepper plants. The entire travel from the district of Hassan to Sakleshpur itself is a bliss. The uniformly arranged crops in the fields glimmering in a lining of water where Egrets and other birds move silently so as to not ripple the water. The entire location is an offbeat one that is pristine and has managed to retain its natural aura despite the passage of time with gushing streams that are common to find. These streams flow all over the place where you can get inside the water which is just ankle deep and wet your feet or sit ashore dangling your legs to the rhythm of water. 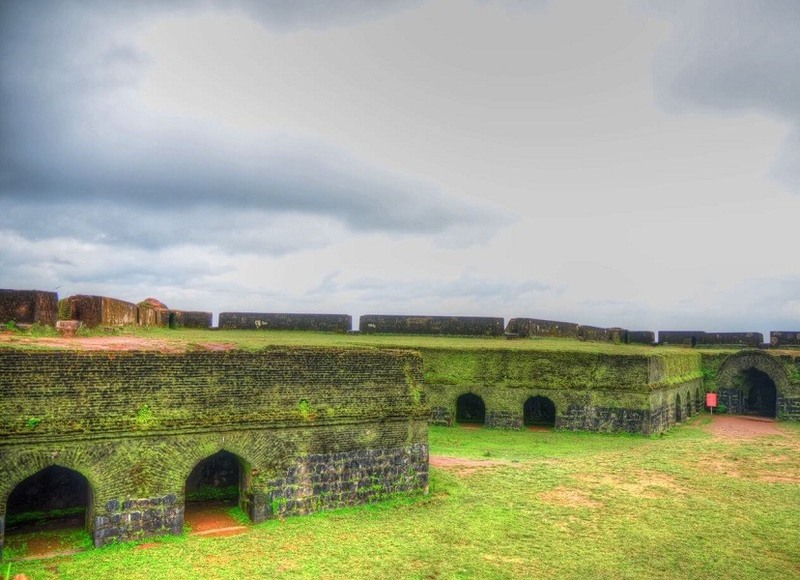 Apart from all the nature, the place is also home to one of history’s most beautifully designed forts, the Manjarabad Fort. 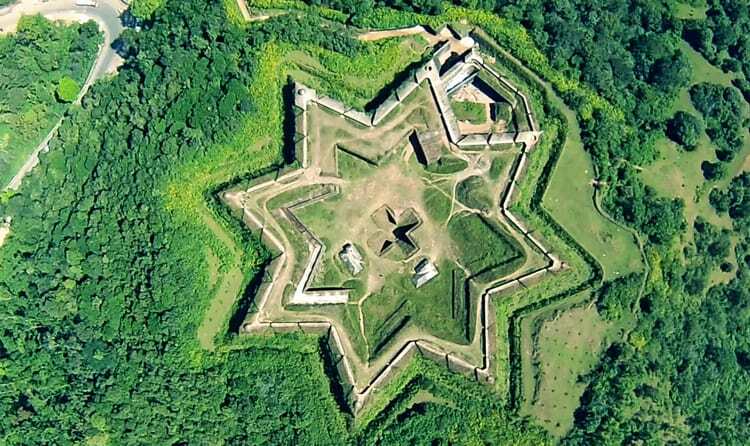 Built by the Tiger of Mysore himself, the Manjarabad Fort is shaped as a star when seen from a bird’s eye view and has a secret tunnel built from the fort to Mysore to escape in case of an attack. There are many stories that revolve around the history of this fort, but none the wiser. As you take a stroll around the City of Gardens, Bangalore, Karnataka, a deep sense of relaxation occurs. Renowned as one of the most modernized cities in the country, Bangalore was once an unimaginable stretch of forest. In the midst of glitzy malls, skyscraping buildings and opulent restaurants, the quaint, colorful garden of Lal Bagh vibrates in the heart of the city. 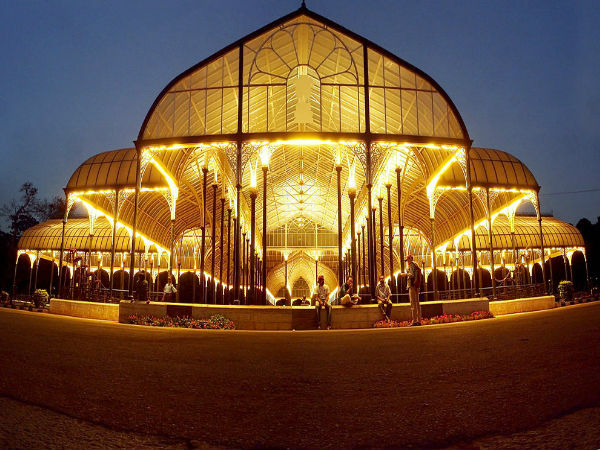 The Botanical garden of Lal Bagh is beyond the imagination your mind can fathom. This garden was commissioned by Hyder Ali who wanted the garden to be a lavish leisure garden which after his death was carried out by his son Tipu Sultan. Under his reign the garden blossomed with infinite stretch of green carpet decorated by hues of colorful flowers. This beautiful garden bustles with flowers during the bi-annual flower show where the brilliant colorful radiation of the flowers are portrayed for the chattering visitors who make the garden bustle with life. During the flower show you can witness monuments and other structures made out of a wide pick of flowers. The dwarf sized gnomes that have climbed out of Snow white’s book can be seen at the entrance of the garden which are sure to catch the fancy of kids. The garden houses various statues like the statue of Queen Victoria and the statue of the Maharaja of Wodeyar. Many, many marvels lie inside the huge garden of Lal Bagh boasting of their heritage and beauty. Situated along the Arabian Sea and projected by the Western Ghats, Karnataka is a state that has many sprawling stretch of beaches. Labelled as one of Karnataka’s most desired tourist destination, Gokarna is a quaint temple town which is different from the other bustling cities of Karnataka with a blend of cultures. 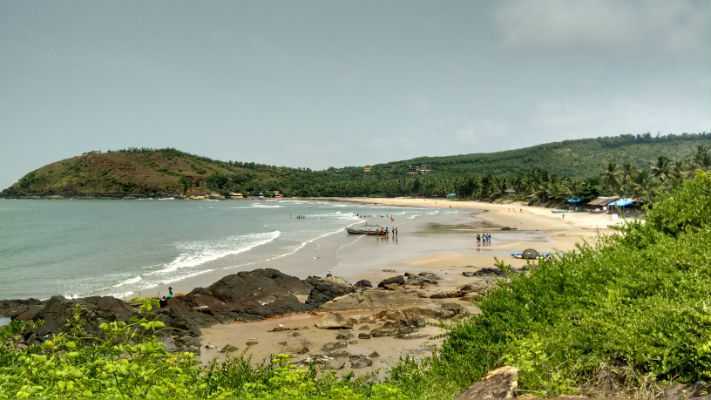 If you want to have the fun from Goa and the serenity of a beach from Kerala, you can see that they both mélange together at Gokarna’s Kudle beach. The stretch of golden sand gleaming with the sun, hidden from view by the green dense of palm trees is a sight to cherish. You can see why this is a most sought after beach in India. The clear blue waves lashing across the sandy beach forming white frothy lines, the sprawling expanse of sand between the sea and the palm groves is sure to melt your troubles away. The beach is swarmed by people from all parts of the world. You can listen to folklores with a group from Scotland, hear about the stories from the streets of Romania, know the lifestyle of a chef who owns a café in La Rochelle or swim in deep waters with a prized swimmers. Most people light a bonfire in the evening as the sun sets across the blue sea illuminating it with a golden stroke. The beach also offers many adventure activities like surfing, trekking, yoga, etc. If you want to take a break from the beach (which is quite not possible), you can visit the Mahabaleshwar temple located nearby. Karnataka is a region which has seen the reign of many prominent rulers in Indian history. Their contribution in the welfare of the land is immense. A spectacular tribute to the glory of Karnataka lies in the ruins of Hampi, the capital of the mighty Vijayanagara Empire. Built brick by brick by many Vijayanagara rulers, Hampi was the cradle of civilization during the Maurya Empire and the Vijayanagara Empire. During the Muslim invasion the entire city of Hampi was looted of its wealth and destroyed left only to bask in its ruins. The walls of these ruins could not talk, yet they speak about the glory of the city in its bygone days. Hampi is a city which has been shrouded by the age of time and has remained intact after its glory fell at the hands of the Muslim sultanates. There is something mysterious about Hampi which no one can describe, but sometimes it feels as if the place is trying hard to rise from the dead and back to its days of yore, or perhaps it is the still monuments that stand forth in all their magnificence with their every chisel shouting out legends. Frozen in time, Hampi has been on the list of every backpacker and history buffs. The place casts its magic in everyone visiting it, telling tales of its might. But once in a year the city comes alive when the festival of Hampi Utsav takes place for three days and nights. People celebrate the city and you can see many shops lined over, beautiful dancing women and vibrating music. Beautiful display of firework also takes place here that illuminate the sky against the silhouette of the monuments. Get mesmerized as time takes a pause in thismagnificent ruins of Hampi. Karnataka has an astonishing variety of architectural monuments which illustrate the skills of the Dravidian people over the years. Temples of this Indian state stand for the intricate work in architecture which was prevalent in different periods. Situated in the quaint village of Kollur is the Mookambika temple which is dedicated to the goddess Parvati. The ancient temple is believed to be built by Parasurama who was an incarnation of the Hindu God, Vishnu. Many people in the country flock to see the wonder in which this temple was built and the beautiful goddess who resides in the sanctum. This is the only temple in India which is dedicated to Goddess Parvathy. Hence, the puja rites here are done in a special manner daily. The temple gives you the sense of deep spiritual feeling that is retained with you forever. With the spectacular sculptures and engineering of the temple, it is no wonder people can stay away from this temple.